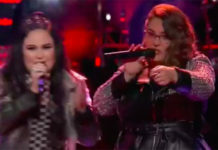 Sarah Potenza and Hannah Kirby from Team blake battled it out with “Gimme Shelter” on The Voice Season 8 Battle Rounds, Tuesday, March 10, 2015! “Sarah, you are a force to be reckon with. Hannah came out here like blowing out of the water too. Literally, it was awesome,” said Christina Aguilera. “For me by far, this the best duel. This battle is incredible,” said Pharrell Williams. “Sarah, you blew us away. 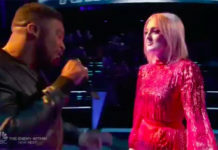 Hannah, if anything just because of the sheer-shocked of how it was completely even, I will give this one for you,” said Adam Levine. “Sarah, I watched you tamed the beast couple of time. 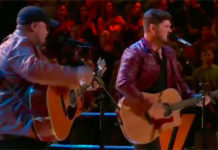 Hannah, you did what you needed to do which was to use that range you have,” said Blake Shelton. Sarah Potenza wins the battle. Adam and Pharrell are on for the steal. However, Hannah Kirby picked Pharrell as her new coach.